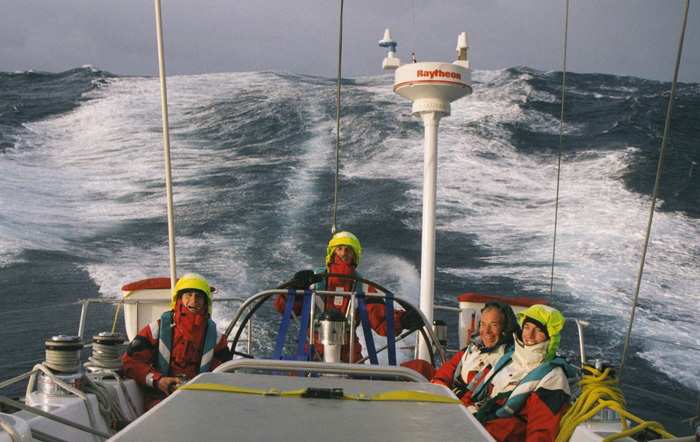 On October 10th 2001 I joined eight others on board the 67ft Challenge yacht EDS in Boston to cruise back to Plymouth. She had been used for Challenge Business promotional work in the USA. The Skipper and his Mate Jasper were professional sailors. The rest of us, six men and one woman, had varying amounts of experience from Atlantic crossings to novice. The skipper balanced the watches accordingly. As the yacht normally sailed with fourteen crew, we knew that we would all have plenty to do as the 67’s did not have roller furling. Shortly after leaving Boston the skipper said with a grin “I suppose you all know that this is the tenth anniversary of The Perfect Storm? Perhaps we should make an offering to Neptune”. This we duly did by throwing coins into the sea and no doubt we all wished for a storm free passage. Little did we know what was in store! After just three days we had hardly learnt the ropes when the weather fax showed that hurricane Karen was in our path. Not only that, we were in the area of the legendary Perfect Storm, just south of the Grand Banks. On October 13th my log shows we altered course to the south hoping the worst would pass to the east of us. Unfortunately we had not bribed Neptune enough as Karen swung to the west straight for us. Soon we were down to only storm foresails with the main handed and boom lashed, as the waves built up to huge proportions. Then suddenly they subsided. Calm prevailed, the sails hung limp as a dazzling display of stars appeared above us – but not for long. The barometer had dropped 10mb in three hours and as the eye passed over us, the ferocious wind hit us again but at 180o to its previous direction and with even more strength. The confused seas built to tremendous heights, mountains of water that only a force 12 can achieve. Spume was blown horizontally off the foaming breaking crests that came up astern and could sometimes be heard above the shrieking howl of the wind. Over canvassed, on the bow it was a huge adrenaline rush as two of us battled to hand the storm jib that Karen seemed determined to claim as her own. Shouts of ‘hold on’ from the helm sounded as if they came from another world as the bow plunged alarmingly from wave crests and we were submerged in the wave in front. Testing us to the limit, the sea continued trying to take us, as we submarined into waves until at last the red beast of a sail was down and secured. Under only the storm staysail the motion of the yacht then eased somewhat. We made our way back aft, thanking providence, the builders of the yacht and those responsible for her maintenance that nothing broke. Only the port danbouy had been lost. To celebrate survival we had a midway limerick competition. However a few days later, the skipper’s call for “all hands” signalled another full-on gale and the need for the trysail – the first time this sail had been used in anger on EDS despite two circumnavigations via the Great Capes. Eventually, after 2876nm of wild weather and some great sailing, we called into Bantry Bay for some R & R. It had certainly been a testing time. Consistent wind speeds of 55 knots, a highest gust of 66 knots, 45 sail changes and top speed of 17.2 knots made me wonder about it being a ‘cruise home’. Ten years on, I ask myself was I lucky or unfortunate to have had that experience? My definite conclusion is: given a Challenge yacht and that crew, I would go again tomorrow! Retired Surveyor Paul Rocky  is an Offshore Yachtmaster with three Atlantic crossings, a three man delivery of former maxi racer GBII from Tenerife to the UK, sailing to 80oN and numerous charters on his 30,000nm plus log. Currently he is planning, with his wife, to paddle a canoe 50 miles from Tewkesbury to Stratford upon Avon to raise funds for the RNLI in celebration of their golden wedding anniversary.